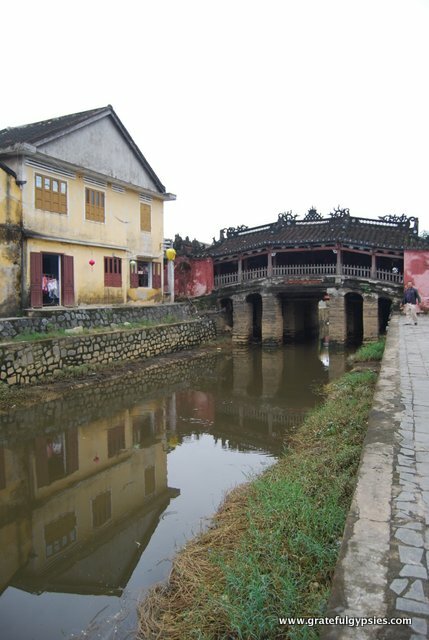 Hoi An was a very important trading port for the Champa Kingdom as early as the 2nd century and it continued as such even after the Vietnamese absorption of the Kingdom. 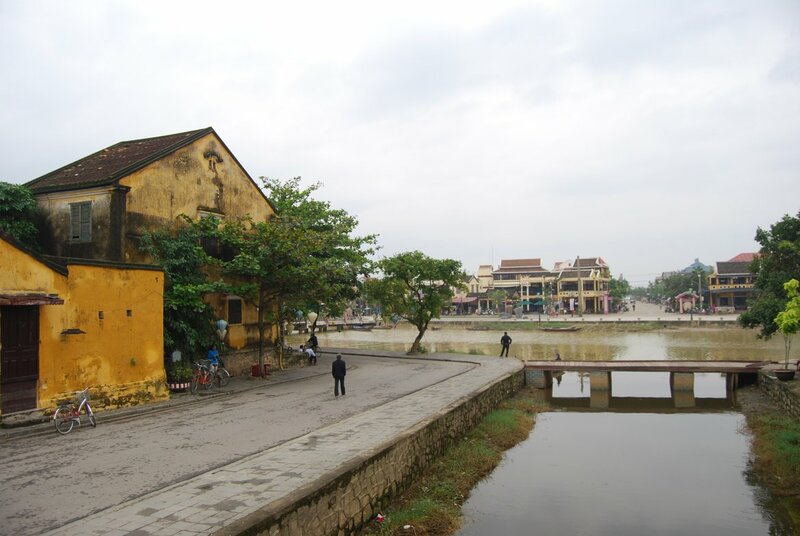 It was the center for mercantile and cultural exchanges for many years and this is the city where Christianity first began in Vietnam in the 17th century. As such, there are many shops – most of which are tailors – and it’s a very popular place to have a suit or a dress made. That’s one big reason why a lot of tourists come here. Storefronts in the Old Town. There are also several quaint bars and restaurants along the riverside where workers will compete for your business as you’re walking along. Most places have the cheap and popular ‘bia hoi‘ (draft beer) for about $0.25 per glass! The food from Hoi An is some of the most famous cuisine in the country, and for good reason. While we enjoyed the food all throughout Vietnam, we found Hoi An’s to be the best. There’s even a food tour that takes you around to try different street foods, but sadly we had neither the time nor budget for it. 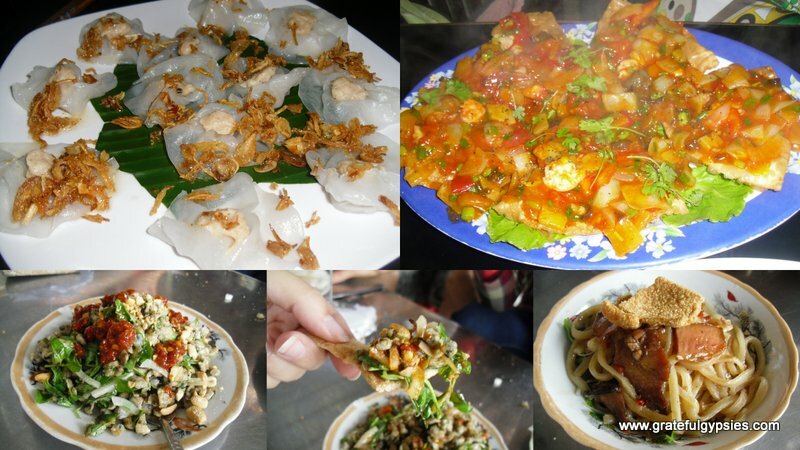 Just a sampling of the fantastic cuisine in Hoi An. Cross the old Japanese bridge with your ticket. In order to see some of the ancient houses, temples and bridges, you can purchase a sightseeing ticket that allows you to choose five different destinations. It’s a small area, so you can do it all by bicycle or on foot. It can also be used on different days in case you run out of time or get distracted by the cheap beer or awesome food one day (which you totally should). 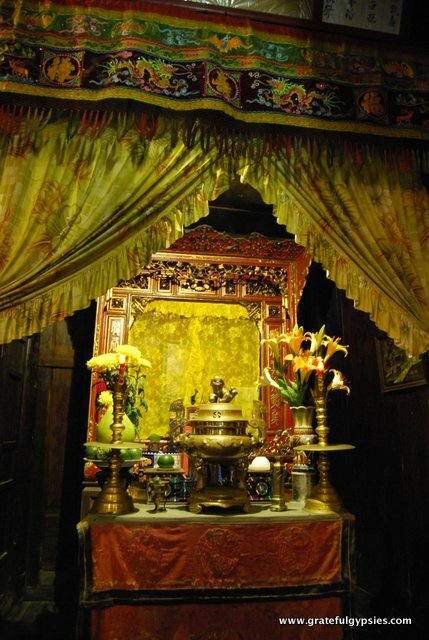 Different options include museums, pagodas, family cult houses for worshiping ancestors and community houses. We chose to visit two of the family homes, a museum, a temple and an assembly hall. Inside one of the old family homes in the town. Yes that’s right….a FREE tour given by local university students on Sundays and Thursdays. Ok – it’s not entirely free. We paid for our bicycle rental and then gave our guide 50,000 Dong each (around $2) that went towards our ferry ride to the island and the villagers we visited there. The student organization does not profit from the tour. Most of them are majoring in English or Tourism and do the tours to practice and gain experience. After meeting our guide, we jumped on the ferry and headed to Kim Bong village just across the water. 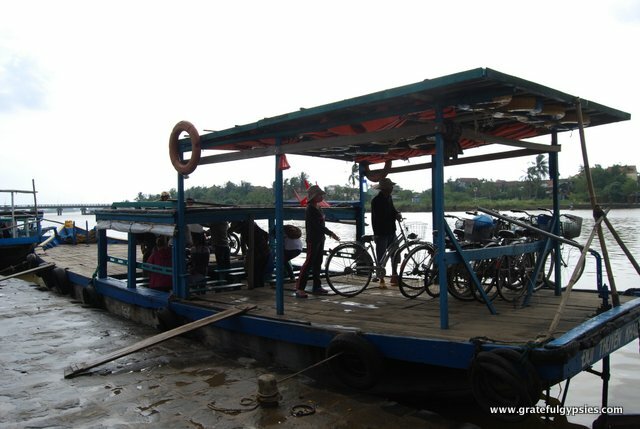 Taking the ferry with bikes across to the small island. Our first stop was the local carpentry village which consists of a shipyard and a small shop with small goods carved from different types of wood. 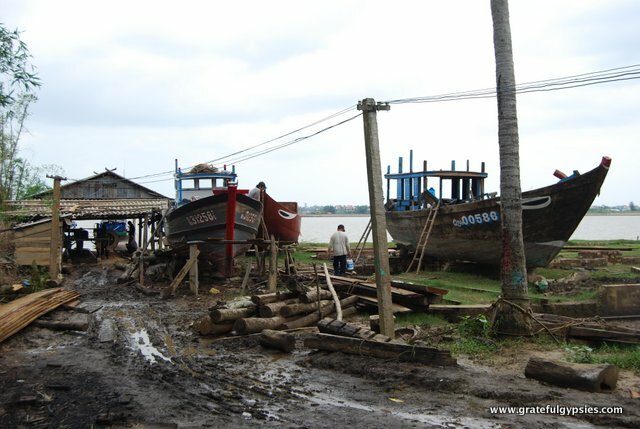 At the shipyard, we watched the workers building new boats and learned that the reason they paint eyes on the front of the boat is so the boat won’t lose it’s way and to scare away evil spirits. We also learned that they make the wood stronger by letting it soak in the water for a full year! 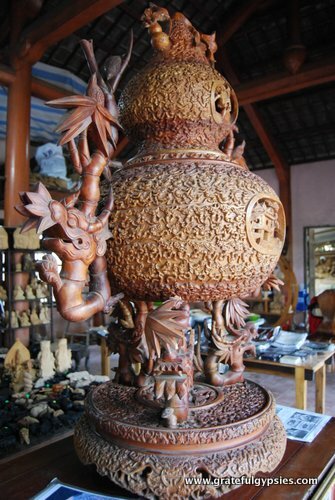 In front of the small shop sat an amazingly detailed wooden carving to celebrate 1,000 years of Hanoi. Our guides explained almost every detail about the carvings; it included most of the popular sites in Hanoi. Next up we went to a Chinese style family temple complete with a family tree and shrines to the ancestors. The outside of the temple was decorated with mythical animals. Our guide explained the meaning and then had us play a short game of charades, acting out each character, to have a bit of fun. Outside of the family temple. 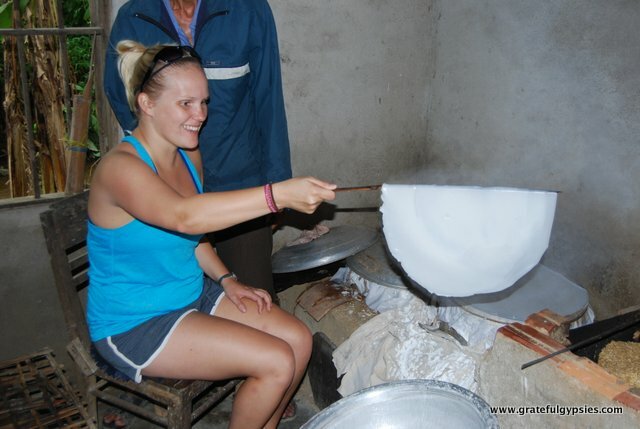 Back on the bikes, we went to a rice paper factory where we were able to feed the chickens and try our hand at making the rice paper (I was a total natural) and then got to enjoy eating the finished product. 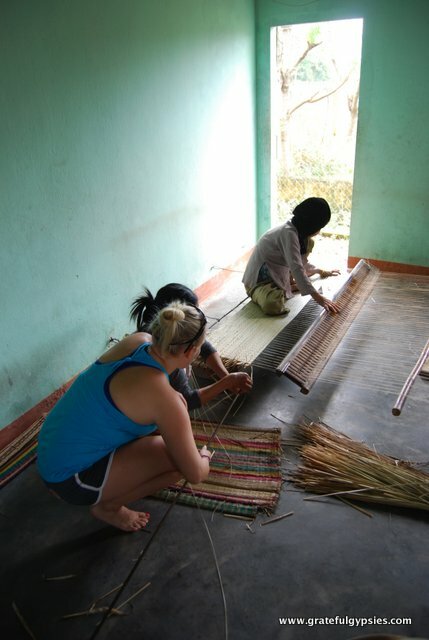 Our final stop was at a small house where they made sleeping mats from straw. We were also allowed to try ourselves and I would never survive in that line of work. The women said they could make one in two hours, but it would probably take me a full day. This tour was a great way to get out there and see how a lot of people in rural Vietnam make a living, and it definitely made these two Gypsies pretty Grateful for the comparatively easy jobs and lives that we have. Learning (and failing) to make a sleeping mat. Finally, the students took us for one final ride around the village before getting the ferry back to town. We had amazing coffee at a local shop and that’s usually the point at which the tour ends, but our guides were so awesome they took everyone in our group to a small local restaurant where we were able to try local specialties without the hordes of tourists. This was one of many days where we had a great time hanging out with Vietnamese college students. They’re always eager to meet foreigners, practice their English, and of course introduce their own culture. Should you ever visit Vietnam, we highly recommend reaching out to local students. If it weren’t for our days spent with them in Hanoi, Hoi An, and Ho Chi Minh, we definitely wouldn’t have enjoyed our time in Vietnam as much as we did. After all of the walking and riding around, we spent our last night hanging out in our hotel and planning the next stage of our adventure. Although we thought we were going to have to scrap the idea of a motorbike trip through the Central Highlands, we met a local guide who we had a good feeling about. We made plans to head out the next morning on a 3-6 day trip into some of the most beautiful scenery in the country. A great place to visit, despite the busloads of tourists. Transportation: We caught the bus from Hue to Hoi An in the afternoon for about $5 each. Despite the fact that it was only a 4-hour ride, we had beds. That’s because this bus is making the long trek down to Ho Chi Minh City, stopping here and there. There is no train station in the town, but you could take the train to Danang from where it’s about a 30-minute bus/taxi ride. 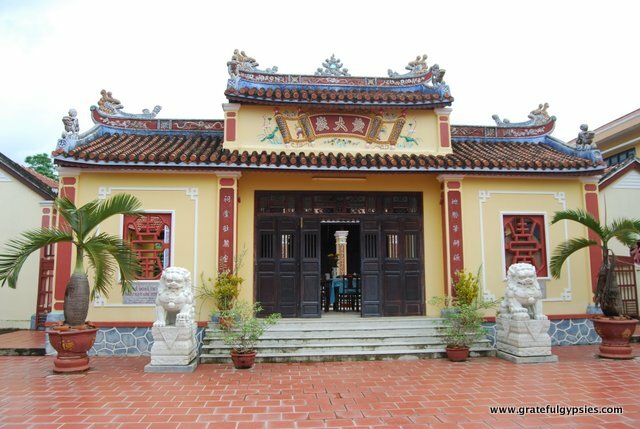 Accommodation: In Hoi An, we stayed at the Hoa Binh hotel for two nights. Our room was a steal at $20 a night – it was big and comfortable, had great WiFi and a desk (you’d be surprised how many hotels do not have one), a nice bathroom, and best of all a pool and a free breakfast buffet. Getting Around: The town itself is quite small, so you can easily cover the Old Town on foot. For further exploration, bicycles and motorbikes are available for rent. Activities: For about $6, you can get a ticket to visit five of the sights around the Old Town. 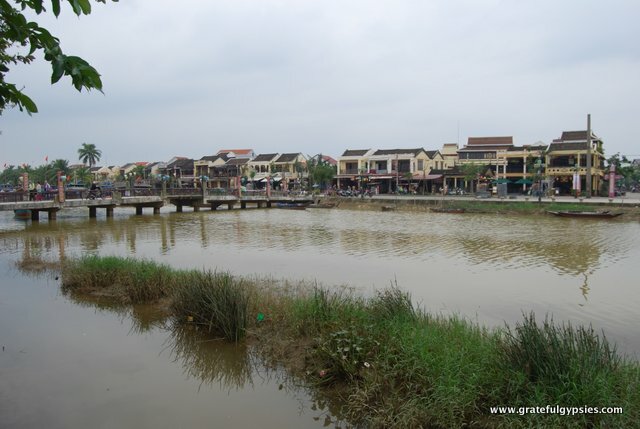 As mentioned, you can join the Hoi An Free Tour every Thursday or Sunday (highly recommended). Other than that, the main things to do here are shop around the tailors and enjoy the many cafes, restaurants, and bars. Food/Drink: The food in Hoi An is incredible. From the white rose dumplings (bahn bao vac), to the “wonton pizza” (hoanh thanh chien) to the cao lau noodles, it was all so delicious. Plus, you can get quarter draft beers right near the river. If you want something a bit more rowdy, there are some bars in town that try to start a party on the weekends. Recommended Time: Two or three days should be enough here, unless you really want to shop around and get lots of clothes made. We had no interest in that, so we just hit the Old Town, did the free tour, and headed out. 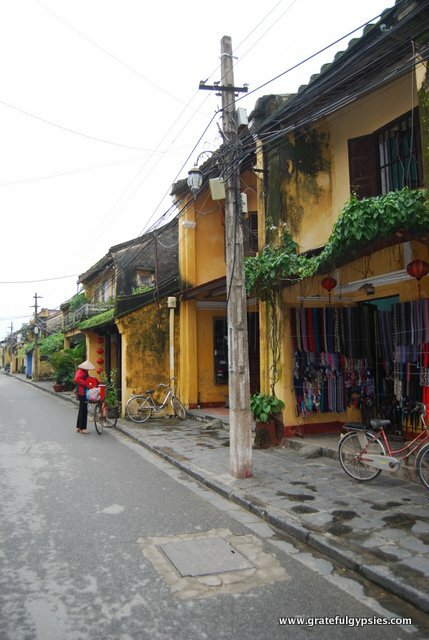 Total Cost: We spent $116 between us for our two full days in Hoi An. Most of our budget went to a decent hotel room and food/drink.